The 11th Annual “Classic at Baywood” Golf Tournament, held in June at Baywood Greens, raised more than $42,000 for Beebe Healthcare’s Tunnell Cancer Center. This popular event raises funds to further the Cancer Center’s mission of providing hope and wellness to its patients. The event’s lead sponsors, Baywood Greens and Onix Group, each donated $10,000 to fund the event. Beebe medical oncologist Dr. Srihari Peri was the honorary chairman and spoke about how Beebe’s cancer program grew from a small office on Savannah Road in Lewes to the large Tunnell Cancer Center at the Beebe Health Campus in Rehoboth Beach that it is today. Beebe Medical Foundation was established in 1989 with the sole mission to raise philanthropic support for Beebe Healthcare. The Foundation is located at 902 Savannah Road, Lewes, DE 19958. To learn more about how you can give, please contact the Beebe Medical Foundation at (302) 644-2900 or visit us online at https://www.beebehce.org. 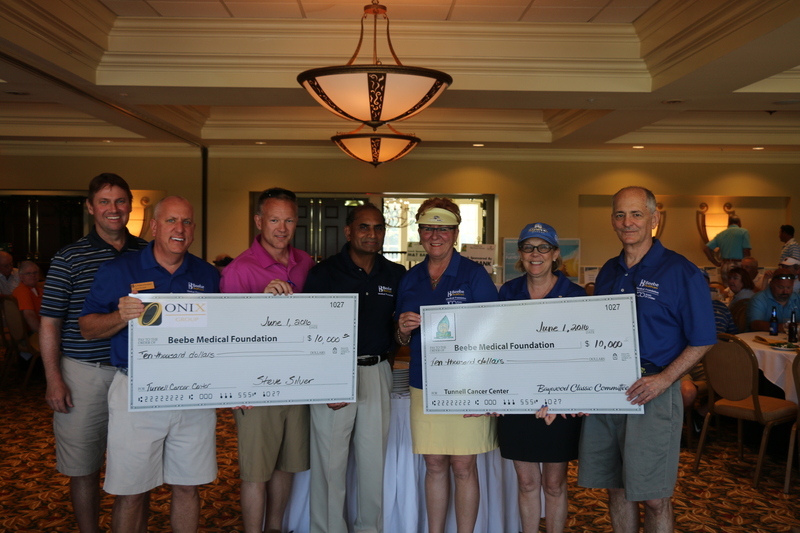 Caption: Shown here, left to right, are: Drew Walls Co-Chair of the Baywood Classic; Tom Protack, Vice President of Development at Beebe Medical Foundation; Lincoln Davis, Co-Chair of the Baywood Classic; Dr. Srihari Peri, Medical Director of Medical Oncology at Beebe Healthcare; Cherrie Rich, Executive Director of Oncology Services at Beebe Healthcare; Judy Aliquo, President and CEO of Beebe Medical Foundation; and Jeffrey M. Fried, FACHE, President and CEO of Beebe Healthcare.